For all of those lucky enough to be able to enjoy ice fishing on a regular basis, one of the essential components that you will definitely need is the best ice auger. At the end of the day, as long as you have an appropriate sized hole and are able to enjoy your time ice fishing, it doesn't really mater what type of ice auger you use. However, depending on the local conditions, your physical capabilities, and how often you're out on the ice, one ice auger may suit your needs much more effective than another. Therefore, our goal with this article is to provide insight into the different types of ice augers available for ice fishing, how those different types may affect your selection, as well as general information regarding different components of an ice auger. 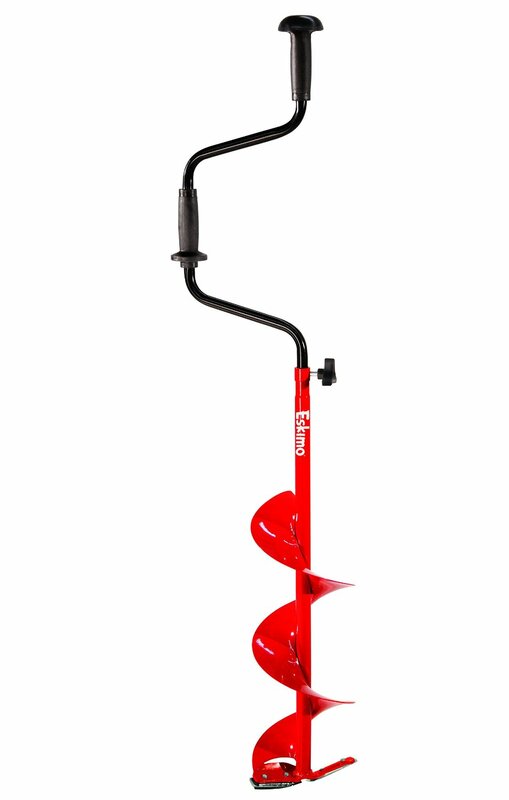 This is a great value ice auger that simply gets the job done. While it doesn't have any fancy bells and whistles, this hand/manual ice auger is the product of a reliable brand and lots of fine-tuning. A key advantage to manual Eskimo ice auger is it's portability. Let's be clear, it isn't small, but it's lightweight at approximately 6 lbs. Furthermore, while you don't have an engine doing the work for you, it still cuts extremely well and is excellent in areas where you don't want to deal with any fumes, such as the shanty. While this is a mechanical product with moving pieces, it's still more reliable than an ice auger with an engine in that you don't have to worry as much about it breaking down or running out of fuel (this goes for electric ice augers, too). This Eskimo ice auger comes in a few different blade diameters (6", 7", and 8") and its length is adjustable from 49" to 58" at each diameter. Eskimo has also developed a cross-bolt takedown system that prevents over tightening during the drilling process. Overall, the hand-powered Eskimo ice auger is an excellent choice for those who want a manual ice auger and don't want to spend too much money, especially compared to ice augers with engines. 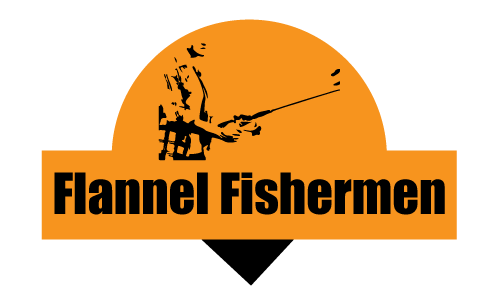 It's known to perform better than other brands, the customer service is good, blades can be easily changed, and the variety in sizes helps optimize for you local ice fishing hole. Therefore, we recommend this ice auger to anyone who is capable of using a hand-powered ice auger, especially if you're looking to save some money. 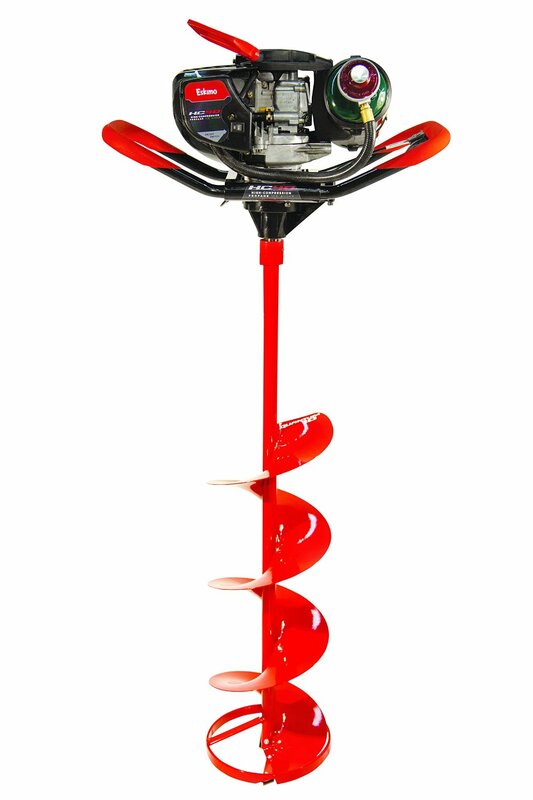 The XtremepowerUS V-Type gas ice auger is a great entry-level gas ice auger. It provides quite a bit of power, especially for the price, as it boasts a 2-stroke air-cooled engine with 55cc displacement and a 1090W output power. The auger itself is 10" in diameter, so it's a little on the larger side. The blade length is a little more than 3 feet, but to be safe, consider the maximum drilling depth to be 3 feet or a little less. It's powerful enough that it's a good idea to have someone else around on your first use if you haven't used a gas ice auger before. This thing is powerful and you don't want to resist it too much, as it's known to be a little tough on the wrists after prolonged use. Overall, we recommend this gas-powered ice auger for anyone looking for that type of ice auger and is trying to follow a strict budget. It's definitely more expensive than a hand-powered ice auger, but by gas standards, it's still very cheap. The main drawback is limited sizes and it's fairly bulky with no blade protector, and it's also a lesser-known brand for ice augers, but at the end of the day, it gets the job done efficiently. Auger diameter is 8" and length is 42"
While it's on the lighter side for a gas-powered ice auger, it still weighs in at about 30-35 lbs. The Eskimo Sting Ray quantum gas ice auger is a solid gas-powered ice auger that offers a little more than base level gas-powered ice augers. It's more comfortable to use, as a greater emphasis is placed on ergonomics and vibration reduction. It comes with a 2-cycle 33cc Viper engine that is known to perform very effectively, but can take a little getting used to at first. It will come with instructions for any necessary clarification. The aufer itself is 8" in diameter and 42" in length, so it's pretty beefy, but still what we would consider to be in the "all-around" range. It will suit many situations. The blades cut like butter, but once dull will need replacement. This is usually quite simple with Eskimo ice augers. It also comes with a blade protector as well as a muffler guard to protect you from hot spots. 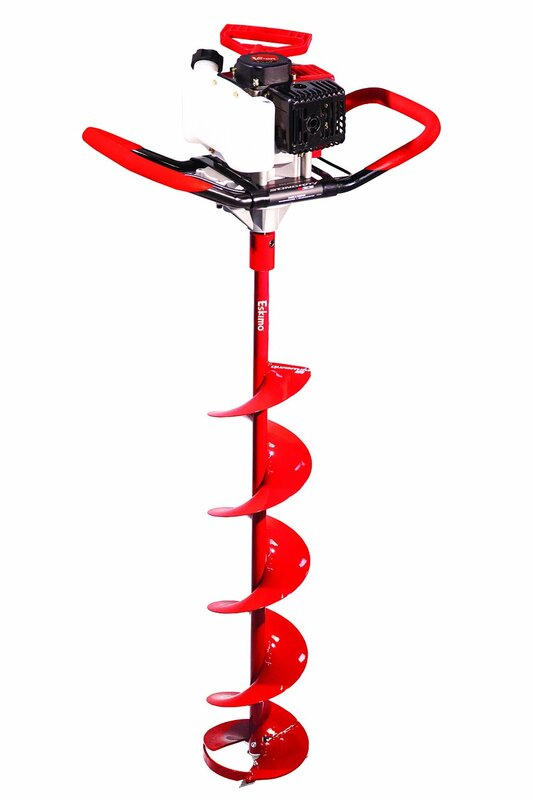 Overall, this is an excellent gas ice auger that comes in at a mid-range price for it's type (that is, gas-powered). So while it may not be the best option if you are on a strict budget, the added features for ease-of-use and comfort, as well as its known performance and reliability, make it an option that is always worth considering. This is arguably the best ice auger available for recreational use. It's made by a very reliable ice auger brand, is known to perform extremely well, and it comes with all the bells and whistles to help ensure you can get the job done quickly and comfortably. Propane provides a substantial advantage in that it's low maintenance and provides a cleaner burn, making it suitable for more situations than a gas-powered ice auger. Unlike lots of other propane ice augers, this one was designed specifically for propane, and as such, the finished product is lighter and more efficient than other propane ice augers on the market. The auto-prime fuel system allows the user to begin drilling with a flip of a switch and the higher compression ratio creates a surprising amount of power, enabling the lightweight auger to drill 10" diameter holes without a problem. Furthermore, the fuel line is larger compared to many other ice augers, which helps with the flow in ultra low temperatures. Overall, flannel fishermen and his team recommend this ice auger to anyone who can afford it, but especially those looking for a substantial step-up from a hand-powered ice augor without having to use a gas-powered ice auger. The propane setup is more reliable than electricity, and in this particular Eskimo HC40 model, the performance is second to none. The main downside is you need to fork out a decent amount of dough for it, so if you have never used an ice auger before we would recommend starting with something cheaper or borrowing a friend's until you are a little more sure of what you need. The BestIce augers are an invaluable tool for ice fishermen, and as such, there is a growing demand to meet all types of situations and environments, and to cater to ergonomic and financial needs as well. Given these are all extremely variable depending on the person and setting, there are a tremendous amount of options available for you to choose from. So how do you pick? At the end of the day, as long as you do a little bit of research, chances are you will end up with something that you're happy with and helps get the job done. However, if you want to try and get the most for your money and feel the most comfortable about your decision, we would like to provide the following pointers for selecting the right type of ice auger for your individual needs. While a spud may be all you need to hack out a hole in the ice, this will become increasingly difficult as the ice becomes thicker. It's also a slow, arduous task, so if you're looking to cut many holes, then that's likely not your best option. If you have been going with this ultra-traditional methods for some time now, we understand it can be difficult to move on to something new, but in this case, a hand-held ice auger is an excellent option. These are way cheaper than gas-, electricity-, or propane-powered ice augers, they are way more lightweight, and they do an excellent job drilling holes in the ice. A good starting point is the Eskimo Hand Ice Auger that we reviewed above and subsequently awarded Best Value. Another advantage of hand-help ice augers is that they can be used anywhere, you don't need to worry about fumes, there is no worry of running out of power (well, your body may disagree), and they are still very effective. For hand-held ice augers, we suggest going with a reputable brand, even if it costs a little more, just to ensure that if there are any issues you have a better chance of having them quickly corrected by customer service. Moreover, if spare parts are necessary, they will be more widely available. If you need really large cuts, let's say 10" diameter or larger, as well as a few feet in length, then it may be advisable to consider a gas- or propane-powered ice auger, but otherwise, a hand-held is always a great starting point until you figure out exactly what you will need most of the time. While you may want to start out with a hand-held ice auger if you're new to ice fishing and don't know how often you'll go or how many holes you'll cut, any other situation may call for a gas- or propane-powered ice auger. With a gas ice auger, you will have the best chance of cutting the deepest hole possible in thick ice. They have been around for quite a while, so designs have been constantly improved, especially in terms of optimizing the engine for the auger's specific requirements. For any ice auger, we usually recommend the Eskimo brand, but this is perhaps most true for gas ice augers. While all perform similarly, or other brands like Jiffy may be preferred by some for performance, the last thing you want to deal with is the thing breaking down. We like Eskimo for that reason, as they're generally more reliable and last a bit longer (everything fails eventually), and if for some reason you have problems with your auger you know you have a reputable company to help you out. The only thing about Eskimo augers is that they can be a little more expensive than other brands. Not by a large margin, but nevertheless, if you're ona strict budget this should be considered. Weighing the pros and cons between a cheap auger and a more reliable auger is never easy, and it simply comes down to what you value most. One thing to keep in mind about gas ice augers is that they aren't completely "easy". So if you're looking for something to take the load off, it won't do this completely. You still need to haul it around (usually 30-35 pounds), plus the gas, and if you use them a lot in a short amount of time you may notice your hands and wrists getting sore. However, it still beats the amount of exhaustion brought on with hand-held augers, just be aware that they aren't completely effortless. Specifically, if you're buying a used auger, look for sturdy handles ideally at about 45 degrees and covered in padding. Lastly, try to keep in mind where you will be using it. If you're in a shack and don't have enough ventilation to get rid of the fumes (which often people don't), then you may want to consider a hand-held or propane ice auger instead. Similarly, they make some noise, which usually isn't a problem unless you're fishing on a lake with tons of houses around the shore. Overall, gas-powered ice augers are a great step up from hand-held ice augers, but it comes with an increase in cost. Most who make the leap are glad they did, but thinking over the pros and cons about your different choices will help improve your chances of loving your new auger. Propane ice augers aren't really as common as gas ice augers, but they have still been around for a while and should perform extremely well. They are cleaner than gas ice augers, but still provide all the powerful advantages. In fact, many propane ice augers can drill faster than gas ice augers and are often just as, if not more, efficient with fuel than the gas augers. Theoretically, there should be no problem with propane ice augers in sub-zero temperatures, but some ice fishermen have in fact found that to be a problem. This issue can usually be alleviated by warming the propane tank and trying again, but that's annoying. This isn't a widespread issue, so we wouldn't expect it to happen with the purchase of a new propane auger, but it is something that has happened. For the above reason, we like the Eskimo HC40 propane ice auger. They designed this basically from scratch, considering the auger to run on propane from the time they designed it, rather than modifying a gas auger to run on propane. This is the main thing we look for, as well as any features addressing any cold issues. For example, auto-prime fuel systems are nice to have, and a high compression ratio will allow you to get the most power pound-for-pound. Check out Joe B's test run of the HC40 below! Overall, propane ice augers are our favorite. They're clean, more lightweight than gas augers, perform extremely well, are surprisingly efficient with the fuel, and are the best step up from a hand-held ice auger that you can make. However, they tend to be the most expensive options, so if you aren't sure about spending that much money, it can be tough to fork it over. In this case, we would recommend waiting for sale on a propane auger until it drops down closer to the price point of a gas ice auger.